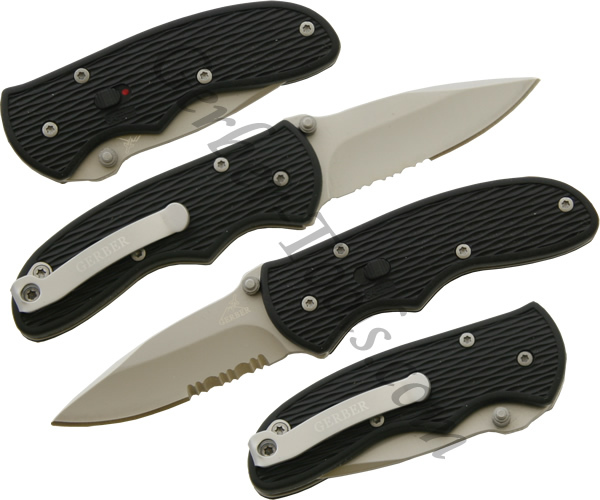 Mini-Fast Draw - Serrated. The Gerber Mini Fast Draw model 22-41525 has a partially serrated stainless steel blade with an assisted opening mechanism. This assisted opening mechanism features Gerber FAST technlogy where you simply push the thumbstuds and the blade deploys in a hurry. The handle is textured for extra grip, and has a dual-functioning piston lock that holds the blade open and also acts as a safety to prevent accidental opening. A pocket clip comes with the Gerber Mini Fast Draw.